Control unit co-ordinates the transfer of data between registers of CPU or microprocessor and ALU. Control unit serves the instructions for ALU. Along with this, control unit, as its name implies, controls every other parts of the machine, their co-ordinations, traffic etc. Thus control unit controls the complete work-flow of the CPU. But control unit doesn't take inputs, give outputs, process data or store data itself, what control unit do is, it controls these operations when they are performed by respective devices. The purpose of control unit to run the whole computer. And control unit is ran by the instructions stored in RAM and ROM. 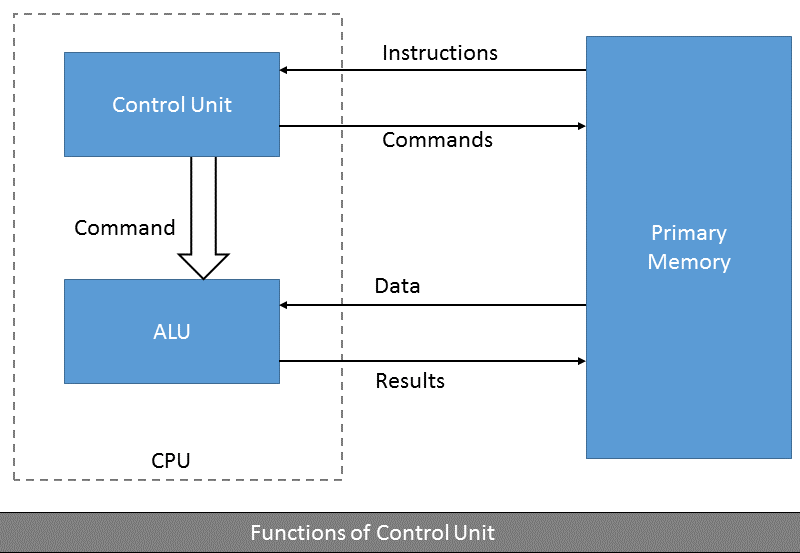 So, control unit receives instructions which are stored in RAM and ROM and controls operations of other connected units or devices through those instructions. Fetching instructions one by one from primary memory and gather required data and operands to perform those instructions. Sending instructions to ALU to perform additions, multiplication etc.